A hedge fund superstar explains in Fortune magazine why stocks are on track for solid gains -- despite the market's sudden selloff. (Fortune Magazine) -- The stunning drop in stock prices dominated the headlines for days in late July -- and not just in the business press. The major market averages in the U.S. fell approximately 5% in a week, the largest weekly decline in five years. The steady rise in share prices that preceded the plunge contributed to investor complacency; bond buyers were not demanding enough compensation for the risks they assumed. Now fear has replaced complacency, and risk is more appropriately priced. LONG VIEW: After 40 years as a money manager, Leon Cooperman doesn't rattle easily. Here are some of the factors behind Cooperman's bullish outlook. Notes: Economic growth, inflation rate, and Fed policy are Cooperman's forecasts. P/E ratio is based on Cooperman's estimate of 2008 earnings. Job growth is average for first six months of 2007. As a result -- and most important because I do not believe recent credit-market turmoil will derail the economy -- I view this market drop as a long overdue correction rather than the end of the bull market. My outlook for the next 12 months has not changed. I believe there's limited downside risk in the U.S. stock market from current levels, and returns over the coming year should be in the low double digits. One key reason is that we are enjoying steady employment growth, averaging 145,000 jobs a month so far this year, which should mitigate the effects of recent debt-market troubles and housing weakness. In defense of my notion that the equity market is unlikely to fall sharply from current levels, I would note the following: First, bull markets do not die of old age, they die of excesses such as accelerating and above-trend economic growth, rapidly rising inflation, and interest-rate hikes from a hostile Federal Reserve. Those excesses are simply not with us today, nor do I expect their arrival anytime soon. Second, the current bull market has experienced no price/earnings ratio expansion -- unlike every other bull market in the past five decades. In effect, this bull market is not characterized by speculation; rather, its expansion has been restrained compared with earnings growth and the trend of inflation and bond interest rates. The economy is not vulnerable to recession and should grow in a sweet-spot range of 2% to 3% for real (after inflation) GDP. Inflation should moderate over the course of the next year, with core consumer inflation averaging approximately 2%. Monetary policy should remain on hold, with the federal funds rate being maintained at 5.25% for the foreseeable future. Valuation is very good in an absolute sense. The P/E of the S&P 500 -- 15 times this year's earnings -- is roughly in line with its long-term average, at a time when return on equity and profit margins are near record levels and the spread between return on capital and cost of capital in the corporate sector is well above average. Corporate profitability and balance-sheet liquidity are excellent. The supply/demand backdrop for shares is still very good -- share buybacks should be near a record level this year, and M&A activity should be strong. Though private equity firms will take a rest for a while because of credit-market issues, they will be substantial buyers of public companies over time. Private equity firms have approximately $400 billion available for investment. Leveraged at a traditional four to one, that creates a $1.6 trillion pool of funds available for purchasing equities, a sum equal to more than 10% of the market capitalization of U.S. shares. In this benign environment, which stocks do I like right now? My portfolio at Omega Advisors has roughly 100 names. To select specific stocks to focus on is a challenge. Nonetheless, here are two outstanding choices. Despite credit worries, Bank of America (Charts, Fortune 500) is still a favorite. It has $1.5 trillion of assets, a 10% deposit market share in the U.S., and more than $21 billion in net income. I believe the company is attractively priced with an above-average dividend yield of 5.4%, vs. the present 4.7% yield on ten-year U.S. governments. It's hard for me to believe that Bank of America stock won't outperform ten-year government bond returns over the next decade -- the company raised its dividend 14% in July. Bank of America is currently trading at roughly nine times earnings, a 20% discount to large regional bank peers. The financial sector has been hit by subprime mortgage problems, an inverted interest rate yield curve, and by a widening in credit spreads. I expect these constraints to lessen over the next several months. I like Atlas America (Charts) because it has made a virtue -- and a very profitable business -- out of oil and gas partnerships; it is the country's largest sponsor of these tax-advantaged investments. Atlas was an early mover into master limited partnerships, a publicly traded, yield-driven vehicle now popular in the energy industry. Atlas has to date spun out three MLPs: Atlas Pipeline Partners (Charts), Atlas Pipeline Holdings (Charts), and Atlas Energy Resources (Charts). Atlas America has retained varying degrees of ownership in all of them. The corporate structure may be complicated, but the growth of the MLPs is easy to see. The first partnership, Atlas Pipeline Partners, was a small Appalachian gas gatherer, since expanded to Oklahoma, Texas, and Arkansas. It went public in 2000 at $13 per unit; in seven years, it has paid out a total of $18.95 per unit in cash distributions and now trades at $54, having just closed a big acquisition from Anadarko Petroleum (Charts, Fortune 500). The most recent partnership, Atlas Energy Resources, an Appalachian E&P company, went public last December at $21 per unit; it now trades at $34, having just closed a big acquisition from DTE Energy (Charts, Fortune 500). Atlas America, essentially a holding company of limited and general partnership units, is a repository of cash (it is debt-free itself). Before the two large recent acquisitions, Atlas was projected to have pretax cash flow of $59 million in 2007 and $74 million in 2008, from MLP distributions and interest income. After the acquisitions, those estimates are up sharply, to $71 million in 2007 and $104 million in 2008, which works out to cash flow, after taxes, of about $2 a share in 2007 and about $3 a share in 2008. Cash flow should increase at greater than a 10% rate in future years, even without further acquisitions. Adding up the current market value of Atlas America's various MLP holdings, the stock is worth $74 a share. There's additional upside to each of the partnerships, as the market digests the significance of the recent acquisitions. Using our target prices for the MLPs produces an implied value for ATLS of $81 a share. 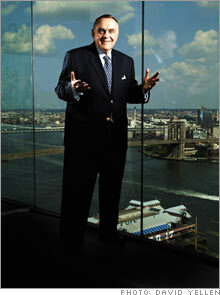 Leon Cooperman is founder and chairman of Omega Advisors, a hedge fund with $6 billion in assets.